While I have to resist the temptation to want to participate in EVERYTHING while I'm here at DePauw, the one temptation I've succumbed to most happily is that I'm going to be sitting in on an interdisciplinary, team-taught course on The Tempest, which will culminate in a production of the play in mid-October by the traveling Shakespearean troupe, Actors from the London Stage. The class will meet for eight Tuesdays, in the late afternoon (4:30-6:30); there are EIGHT professors co-teaching it, drawn from English, Communications and Theater, and Classics. And . . . we are going to get to ACT OUT SCENES! And the Actors from the London Stage are going to help us with our scenes! And even the one non-student auditor, ME, will get to be in one of the scenes! My line was "And in her most unmitigable rage." We ran through the speech together many times. First we just read it, each of us reading his or her line in turn. Then we read our line exaggerating whatever punctuation was given. We read our line adding emphasis on one particular word. We read our line while walking randomly around the room, so that we wouldn't have the clear cue from the person standing next to us. We read our line while stamping our foot on the emphasis word. We read our line in a volume exercise so that the speech would begin in a whisper and end in a shout. Most fun of all, we read our line as we thought a bad actor would, with plenty of excessive emoting and melodramatic gesticulation. Now, when the performance of the play takes place eight weeks from now, I will be in a quiver of anticipation to see what professional actors will do with MY LINE. I can't wait to hear "And in her most unmitigable rage." I'm always looking for lessons in everything I do that I can apply to writing and to life. Certainly yesterday I learned how much punctuation matters to the ear of the careful reader. I learned how much dynamics - modulations of volume - add to a scene. Most important, I learned how freeing it can be to be given permission to speak a line badly. Some of our bad acting was pretty good. Or at least gave us ideas for how to make our acting better. O brave new world that has such a class in it! Saturday afternoon was the gala "Welcome to the Class of 2015" Prindlepalooza out at the Prindle Institute: a chance for freshmen and others to come visit us for an afternoon and immerse themselves in our wonderful world. I had no part in organizing the event, except for joyfully helping to wrap fifty Hershey bars in special Prindlepalooza wrappers (the kind of job I adore) to give out as scavenger hunt prizes. So I had the chance to attend just as a most happy guest. At first I was a most nervous guest. This was the first-ever Prindlepalooza. An enormous amount of thought, energy, and love had gone into the plans for the event. We were going to show two documentaries: No Impact Man (about one man's crusade to spend a year having zero net negative environmental impact from his life), and Waiting for Superman (about America's failed public school system). We were going to have yoga, meditation, a terrific band (the violinist is a Prindle intern who is also a student in my Rousseau class), popcorn, snowcones, giveaways of Prindle combination-pen-and-highlighters and Prindle sticky notes - oh, and all those specially wrapped candy bars. What if nobody came? After all, the story of an author's life is attending events where nobody comes. At one o'clock I thought maybe this would be yet another of those events. Then: the bus arrived from campus. Was anyone on the bus? Yes! And as the afternoon progressed, full bus after bus kept arriving. It was a perfect afternoon. I watched both movies - both were intensely thought-provoking. That no-impact guy: why didn't he turn off his stove as well as his fridge, huh? And why did he get rid of his TV but not his computer, huh? And why did I, and many others, feel like poking holes in his story rather than letting myself be inspired by it? Waiting for Superman: are teachers' unions really the villains here? What other factors seem to be equally important as explanations of the persistent poor performance of inner city schools? Both films reflect the Prindle's mission to ask messy and important questions rather than prescribing perfectly packaged answers. I wish I had had time to try yoga, too - maybe I would have liked it? Probably not - I've never liked any physical activity all that much, but maybe it's yoga that I've been waiting for all my life? I wish I had had more time to sit outside with the students who weren't watching the films or doing yoga, and just listen to the band on that cool sunny afternoon and talk together about what really matters. The good thing is that I'll have the rest of the year to experience all the opportunities that the Prindle has to offer. I'll even have a chance to create some of those opportunities to offer to others. And right now I think I'll go see if there are any leftover Prindle candy bars, and if they're available for the taking. There is nothing like the thrill of solitary exploration - either going on a journey without being sure of your final destination, or being sure of your destination but not being sure of how you'll get there, or what you'll experience along the way. Yesterday I had not one, but two episodes of exhilarating discovery. The first was my morning walk. I haven't been walking much since I arrived in Greencastle, two weeks ago, partly because almost every single place I want to go is within two blocks (literally) of my sweet little house: philosophy department office, new church, public library, and downtown built around its courthouse square. The only place I go to regularly that isn't within two blocks of my house is the Prindle Institute. Yesterday I figured out how to walk there, entirely on trails through the university's 500-acre nature park. I had one failed attempt at this walk the day before, which is what happens when you try to use a map rather than just asking your friends. The map was one of those "not to scale" maps, which I realized only after I had walked very far on a hot afternoon to try to find the entrance to the nature park. On the second try, map abandoned, I took my friend Keith's counsel and cut through university athletic fields, and then there I was, on the path I was seeking. The signage in the nature park is fairly mysterious to the newcomer: did I want trail C2? W3? But then I saw one sign that pointed the way to the Prindle. I continued down that trail, made one wrong turn, corrected my course, and then I saw the roof of the Prindle's adjacent Bartlett Reflection Center. There it was, there it was! That should have been enough triumphant journeying for one day, but on my return from my walk I hopped in my car and drove west on Walnut Street, which I now knew from Keith would become the road to Parke County, the county allegedly filled with covered bridges, more covered bridges than anywhere else in the world. I drove for maybe half an hour, maybe more, and then - there was a covered bridge! And then there was another one! And then I was in the town of Mansfield, one of the sites for the huge covered bridge festival to be held in mid-October. The town was mostly deserted, but the historian in the old mill shared village lore, and the lady who owns the little sandwich shop sat down at my table (I was the only customer) and chatted with me all through my lunch. Upon learning that I had driven to Parke County partly in search of fudge, she gave me a package of microwaveable fudge mix off her store shelves just as a "Welcome to Indiana" gift. Yay for the joys of exploration! The Prindle Institute for Ethics has sixteen absolutely wonderful student interns who work here throughout the year: organizing events, assisting with publicity and promotion, sitting at the front receptionist desk, giving tours of the facility, and more. In order to play their role as receptionist/tour guide, I found out at the intern meeting last week, the interns are required to take a quiz. "Ooh!" I thought. I love taking quizzes! Even though this wasn't required of me as a mere visiting professor, I got busy studying. But then eagerness became replaced with agitation. What if I failed the quiz (meaning, what if I didn't have a perfect paper, better than everybody else's paper)? What if I was WRONG about one of the answers? What if I was humiliated, humbled, SHOWN UP by others? It struck me how scary it is to be someone who has to take quizzes and tests and to write papers for grades, how brave you have to be to be a student. I took the quiz just now. It was HARD. Because I had finished cramming for it seconds before I took it, I did pretty well. I knew the name of the architectural firm that designed our gorgeous building: Lake-Flato. I knew the material for the gleaming polished floors: fly ash concrete. I knew the name of the first director of the Prindle: former DePauw president Bob Bottoms. I could name recent and upcoming events: a panel discussion on the use and abuse of Adderall on college campuses, a conference on ethical issues involving video gaming. I did get some answers wrong. I didn't know the name of the generous donors who fund the intern program (now I do: the Hillmans); I didn't know the location for the locally quarried limestone (now I do: Bedford, Indiana). In one case, I argued shamelessly for points that were going to be subtracted from a barely adequate answer. And then I begged my grader, our assistant director, to give me a gold star on my paper, which she did. I love looking at the gold star. I'm looking at it right now. I'm not sure I love remembering how hard and scary it is to submit myself to evaluation and judgment of this kind by others. I guess it's good to remember this periodically. Good - but hard and scary, too. I have one set of constrained work-related choices for Monday, Wednesday, and Friday, the days I'm at my office at the Prindle Institute. I have a different set of constrained choices for Tuesday and Thursday, the days I'm at my Philosophy Department office in Asbury Hall. For one thing, I don't have a computer in my Asbury office - hooray, no temptation to check email! If I want to check it, I can walk fewer than 100 steps (200 tops) to use a computer in the library. Or I can walk the two blocks to my house, but I'm trying not to allow myself to return home until the end of my self-imposed work day. Today I required myself to stay at my office from 9-10, then I taught from 10 until 11:30 (my Rousseau class with SIX students, all highly motivated and delightful). And then I required myself to stay at my office (with a brief lunch break) until 3. I list 1-3 as my office hours, so now I'm truly bound to be there during that time. All I'm allowed to do during this time is campus-related tasks. I can read articles and books about Rousseau (I have HEAPS), prepare for class, grade papers (though of course I won't have any for a long time), and interact with colleagues and students. I also allowed myself today the option of reading The Tempest, for the class I'll be sitting in on that begins next week. The result: today I did indeed prepare for class, reread part of David Gauthier's brilliant and beautiful book on Rousseau (which brings me to tears whenever I read it), and read through the entire Tempest. Tomorrow I'll pack my Prindle totebag, but I may pack a MORNING totebag and then leave for lunch and return with a different AFTERNOON totebag. There are certain things I really have to do tomorrow that I won't do if any other sanctioned work options present themselves. Those things will go into the morning totebag. The afternoon totebag will have things I need to read to organize the reading group. Although I didn't raise my own children this way, I know from reading (and ignoring) many parenting books that the way you are supposed to get your children to do something is to give them a certain kind of limited choice about how to do it: "Do you want to brush your teeth with the RED toothbrush or the BLUE one?" I can't quite remember, now that I look back to those early years, what I did instead. I think I just told them to do whatever it was and either they did it or they didn't. 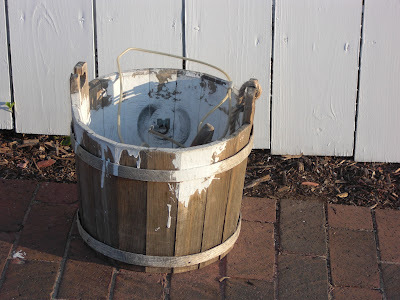 7) my blog to write. I was allowed to work on any of these. There was no particular one that I HAD to work on (though organizing that reading group has a self-imposed Monday deadline, and the first meeting of my Rousseau class is at 10 tomorrow morning). And I was permitted to check email only once an hour (my post-retreat resolution). So far this has been a lovely productive day. I ended up reading - and LOVING - the entire book on the art and craft of memoir and now feel very inspired about canvassing the other possible readings for the group. I finalized the Rousseau syllabus. I'm writing this blog post. So three out of the seven are done. I don't sense any energy left in me today for writing the book reviews or the recommendation letter. But now American Grace and The New York Times beckon. Maybe I should have raised my boys this way, after all. Everyone else in the Philosophy Department here seems to have fascinating things on their office doors for students to peruse while waiting or wandering: announcements of interesting relevant events, cartoons, memorable quotes about philosophy. So this morning, on the day before classes begin, I went over to Asbury Hall and decorated my own door. On it I put two announcements for the upcoming Prindlepalooza on this Saturday afternoon, an open house at the Prindle Institute for Ethics with music, yoga, meditation, snowcones, popcorn, and the screening of two films (No Impact Man,a movie about how one man and his family live for one year in New York City without electricity, toilet paper, and pretty much anything that will leave any sort of carbon footprint, and Waiting For Superman, a documentary that analyzes the failures of American education by following several students through the educational system, hoping to be selected in a lottery for acceptance into charter schools). I don't know if I am ready for the semester to begin, but my door is! My first week here at DePauw University has been nothing but picnics and parties. Well, I did sit for two full days in New Faculty Orientation, and attend the half-day Faculty Institute, and the back-to-school Convocation. But all I had to do at those events was listen to other people talk, soaking up information and inspiration and eating huge amounts of food. I didn't actually have to DO anything. This week real work begins. My plan is to spend Monday, Wednesday, and Friday at my office at the Prindle Institute, and to spend Tuesday and Thursday (my teaching days) at my office in the Philosophy Department. The plan is to spend all day in these offices, as if I have an actual - what's the word? - JOB. I'll come to work in the morning, work all day, and then go home when the day is done. After all, the whole point of being a visiting faculty member is to be an visible and active member of the academic community. You can't be a visible and active member of the academic community if you hole up in your own house. So here I am at the Prindle this very minute. My office window looks out at trees in the courtyard. It is so peaceful and quiet here. This morning I'm going to work on organizing the reading group I'll be leading on the ethics of life writing (ethical issues that arise in writing memoir, autobiography, biography, anything that draws on the lives of real people). And for good measure, I might as well plan out all the great things I'll be accomplishing all year. Why not? I have hours and hours to spend here in my beautiful serene office. Maybe on this new schedule I really will accomplish something dazzling. The odds are in my favor. Ever since I arrived at DePauw University a week ago today, I've been struck constantly by the thought: THIS is where I belong, THIS is where I should have had my academic career. Even if not necessarily here, somewhere like here, that is to say, a small liberal arts college rather than a large research university. I just attended the start-of-the-year Convocation to welcome the approximately 600 freshmen. The entire faculty was there, in our regalia, standing in two long rows, applauding the students as they walked past. At a small liberal arts college like this one, this really is what it is all about: teaching the 2400 students who have chosen to come here to be educated, and also creating a rich intellectual community in which faculty and students alike can thrive. Oh, and changing their lives. And preparing them to change the world. I love the sense of community here. I already feel as if I can recognize half the faculty at least by sight, and even some of their partners and children. Because there will be a production of The Tempest here on campus later this fall, course after course is focusing on the play, including an eight-week, interdisciplinary, team-taught course exclusively on The Tempest (which I'm going to sit in on), all so that everyone can be in a frenzy of excitement when the day of the play arrives. This is not to say that I do not love my own university. A huge research institution like CU is a thrilling place. At CU I get to teach and mentor graduate students, and it's hard to think of anything more wonderful than being in their company. Boulder itself is paradise. And, even if it weren't, it is at CU and at Boulder that I've made my life. Still, if I had it to do over again. . . . I do love little liberal arts colleges so much. . . .
That said, I can't regret the path I did take. It's given me riches beyond all reckoning. Heck, it is the path that led me here, today, to the spot where I am right now. I will return to that life in a year with a grateful heart. Till then: I'm glad I have this year to savor the road not taken, a year to have the experience of taking that road, after all. Today was day one of the two-day orientation for new DePauw faculty. I don't remember ever having new faculty orientation when I joined the faculty at the University of Colorado almost twenty years ago. I do remember a lovely reception, and a workshop or two on how to get tenure ("Don't do lots of service. If you do lots of service, everyone will love you and they'll all come to wave goodbye with their little hankies when you're denied tenure"). In contrast, today was filled with informational talks about resources for faculty development at DePauw, talks about the nature of the DePauw undergraduate community, talks about academic integrity, talks about syllabus design. Despite my two decades of university experience, I found it all extremely engaging and helpful. I came away with encouragement for giving my students lots of small writing assignments throughout the semester and careful "staging" of bigger assignments with due dates along the way for abstracts, outlines, drafts - a real sense that part of my task as a university professor is to give students as much genuine help as I can to allow them to succeed in my course. I experienced some wonderful moments of kinship with the speakers, as when the woman talking to us about academic integrity said that she would rather fail to catch a few plagiarizers than to create a climate of automatic distrust of her students (e.g., by having students submit their papers online through a plagiarism-detecting filter such as turnitin.com). Yes! I liked all my fellow new hires, even though they are twenty or thirty years younger than I am. One of them I already adore: a young professor in conflict studies who also loves children's literature. Plus, I got a DePauw water bottle. And a map of Greencastle. I was treated to an excellent lunch at the Inn at DePauw and an even more excellent dinner at the home of the university's most hospitable and genial president. 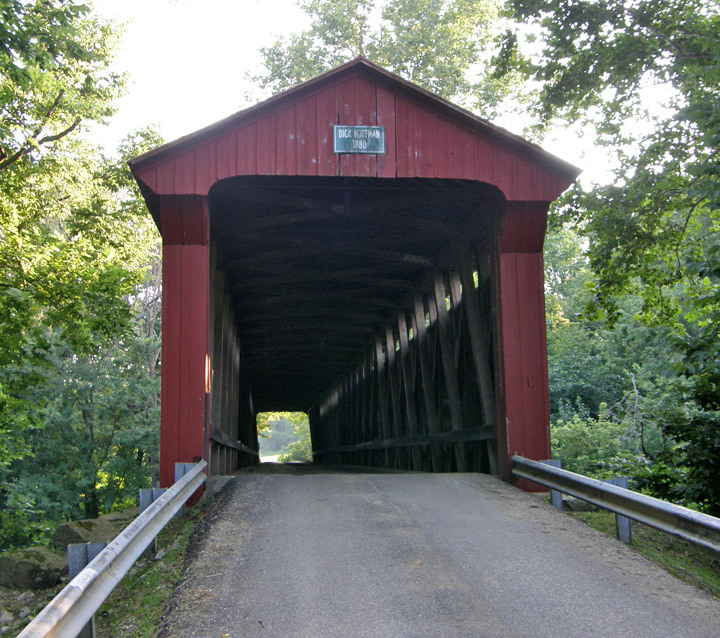 Best of all, I learned that my new county, Putnam County, has nine covered bridges! I can't wait to see them when the leaves are turning, and when the snow is falling, and when flowering trees are in blossom. When I told one of my friends back home that I was excited about new faculty orientation, she seemed puzzled: "Um - what exactly is it that you're hoping it will be?" At the time I didn't have any carefully formulated expectations. But whatever they were, good teaching tips, a DePauw water bottle, and a map of all the nearby covered bridges exceeded them. In the car on my long lovely drive from Colorado to Indiana, I listened to 11 1/2 hours of The Paris Wife, by Paula McLain, a fictionalized account of Hemingway's marriage to Hadley Richardson. I loved it: already a Francophile, I loved spending time in 1920s Paris in the company of all those expatriate writers, I loved the heartbreaking doomed romance between Ernest and Hadley, and I loved McLain's presentation of Hemingway's journey to become a giant of twentieth century American letters. What stuck me most about Hemingway's early career as a writer was how seriously he took writing during years of rejection. Although he had some success as a journalist, he was all but unpublished as a literary writer. Nonetheless, he moved to Paris simply because Sherwood Anderson told him that was the place for an aspiring writer to be. So there he went. He wrote all day, every day, for years, mingling with more successful writers (making use of Anderson's letters of introduction); he never seemed to question whether there was anything else he should be doing instead of putting pen to paper, or typing away on his Corona typewriter, day after day after day. In the novel's most nightmarish episode, taken directly from real life, Hadley is traveling to meet Ernest, bringing with her a valise filled with ALL of his writings from the past three years, every single draft of every single manuscript (save one) on which he had toiled for so many months - and it's stolen from her on the train. Gone. I kept listening expecting somehow that it would be found again - didn't it HAVE to be found again? Wasn't it just too horrible to be true that it wouldn't be found again? But it wasn't. And so Ernest Hemingway had to start all over again. And in starting all over again, he wrote the sketches that became his first commercially published book, In Our Time, and then his first masterpiece, The Sun Also Rises. Of course, it helped a lot that he had Hadley loving him, praising him, supporting him both financially and emotionally, even if she was the one who was responsible for allowing the valise full of manuscripts to be stolen. But still: it made me wonder what all of us as writers could accomplish if we wrote steadily for year after year, giving our writing our best, refusing to be discouraged by constant rejections and horrific, crushing setbacks. It did make me wonder. I've now slept in my sweet little house in Greencastle, Indiana, for two nights. From the outside, the house is shabby - in need of a fresh coat of paint, and with something apparently growing out of the gutters. Inside it is darling, just what I wanted: completely furnished, including five tall bookcases filled with books on Latin American politics and MANY pictures of Che Guevara (the guy who is subletting it to me is a radical leftie in the political science department, on sabbatical in Guatemala). The overall effect is homey and cozy. The house is literally two blocks away from: a) my office in the philosophy department; b) the enticing Carnegie public library; c) the Gobin Memorial Methodist Church; and d) downtown Greencastle, built around the courthouse square, with a couple of charming eateries, a used book store, a Goodwill store (I already bought myself a new fall outfit), and a farmers' market on Saturday morning. It's a mile or two to the Kroger grocery store and to my other office, at the serenely beautiful Prindle Institute for Ethics, overlooking a nature park/wildlife refuge. So far I've attended a barbecue with my new philosophy department colleagues (I loved them all), attended church, had lunch with dear former grad student Jen Everett (who is on the faculty here together with her husband Rich Cameron, also a former CU graduate student), explored the town by foot and by car, stocked up on groceries, bought myself a DePauw notebook at the bookstore, and figured out how to do my DePauw email account. Shortly I'll head off to a picnic to welcome international students. New faculty orientation is Wednesday and Thursday. It's still hard for me to believe that this is where I LIVE now. This is my new world. This is where I'll establish the rhythm of my days. I brought so little with me: books and papers, clothes, computer, Ruby the jackrabbit puppet. That's it. Everything else is the stuff out of which I'll create this new life for myself, the new life I'm already living right now. On the second night of my trip, I stayed in Hannibal, Missouri. 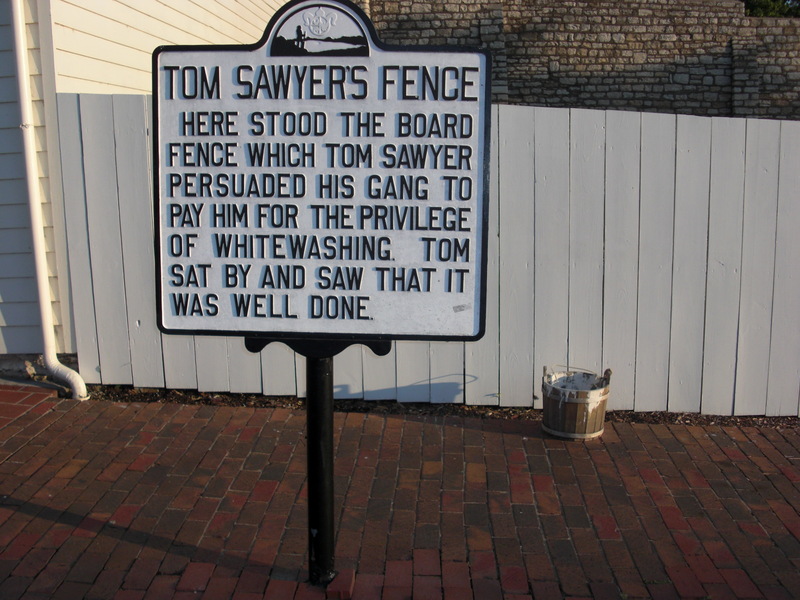 While my bed-and-breakfast room turned out not to have a Mississippi River view (though the innkeeper kept insisting that it did indeed have a river view - in the winter - when there were no leaves on the trees), it was conveniently located so that I could see all the Mark Twain sights, including the actual fence that Tom Sawyer whitewashed, with the actual bucket of whitewash still sitting there beside it(well, maybe not the ACTUAL fence and the ACTUAL bucket, but I still had a thrill when I saw it). 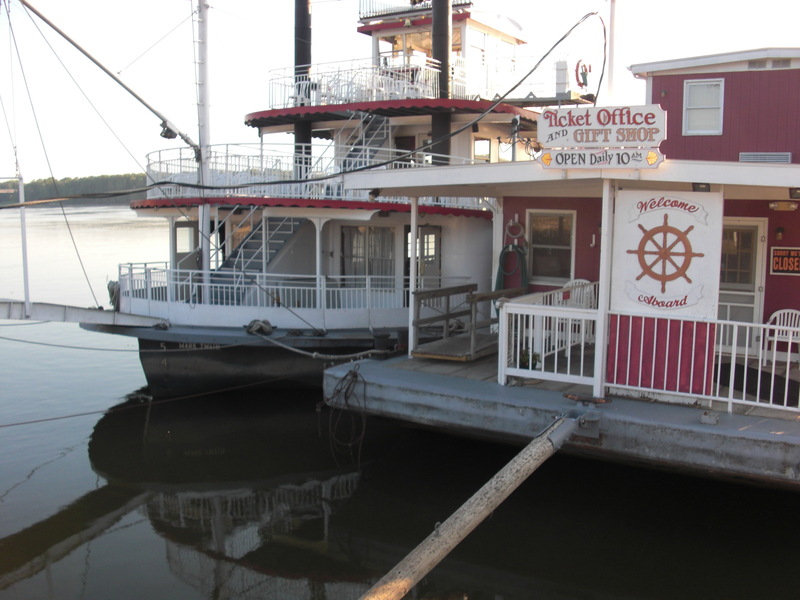 That night, I treated myself to an evening river cruise on the Mark Twain Riverboat. I was the only person on the whole boat who was alone. The others all seemed to be celebrating wedding anniversaries, and I was much in demand as a photographer for the happy couples. But I didn't feel lonely or sad. 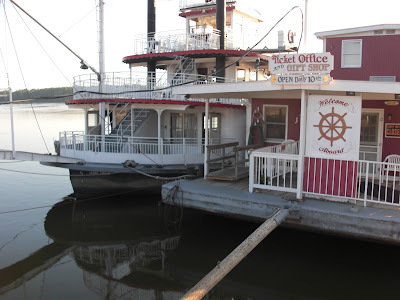 I sat on the deck, listening to the banjo player strum river-themed songs, from "Way Down Upon the Swanee River" to "Rolling on the River," and I watched the Mississippi River banks as we drifted on by. Early the next morning, I strolled through Hannibal's deserted streets and climbed up many steep flights of steps to the lighthouse on the hill above town. I remembered how I had strolled the streets of DeSmet, South Dakota, Little Town on the Prairie, all alone in the early morning several summers ago. It's so much easier to put yourself in another time and place when you are by yourself. With no busloads of tourists congregating, it was just Tom and Huck and me, ready to whitewash a fence, ready to float on a raft down the Mississippi. The Dusty Farmer Motel in St. Francis, Kansas, was neither dusty nor filled with farmers, but it was fine and comfortable for me and Ruby. 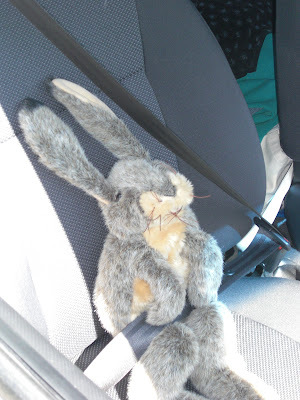 My traveling companion is a plush jackrabbit puppet named Ruby, one of the four principal puppets who participated in the Where the Wild Things Worship service for which I was a leader/organizer for the past two years. Church friends felt that Ruby, my favorite puppet, should get to come with me on my adventures, so I strapped her into the passenger seatbelt, and she has ridden along happily with me for the first eight hundred miles, and she slept beside me the first night at the Dusty Farmer. This is the first long road trip I have ever taken all by myself - well, all by myself except for Ruby. I'm loving everything about it. Route 36 across Kansas was so beautiful. One of our CU philosophy department grad students is from Kansas and adores all things Kansan; she told me to stop in Smith Center (very near the geographical center of the lower 48 states), and I breakfasted there at the Second Cup Cafe, where I seemed to be the only non-local among the little old ladies enjoying a leisurely chat together. In the car as I drove on after my veggie omelette and home-made English muffin bread, I listened to many hours of The Paris Wife, a novel about Hadley Hemmingway, Ernest's first and most beloved wife. It was strangely satisfying to be dividing my focus between Kansas and Paris. I drove seven hours straight without a break, so happy, so happy. Now I'm in Hannibal, Missouri: more stories to come. And this afternoon I'll be in Greencastle, where my new life will begin. That is how many hours I have left to live my Colorado life before I drive away to my Indiana life. I've packed four very heavy cartons of books and papers: books on Rousseau for the course I'm teaching in the fall, books on feminism and the family for the course I'm teaching in the spring, lots of poetry books to read just for fun, all the copies of my Honor Student Expelled novel with critique group comments on them for when I begin my round of revisions, manuscripts for two new children's book ideas, manuscripts for two children's literature articles (and all the books that go with them), manuscripts for two philosophy articles-in-progress (one that I had forgotten about completely until I found its heap of papers when I was packing) - oh, and old journals to rely on in writing my Pulitzer-prize winning memoir. That's a lot to fit into four cartons. Today I'll pack my clothes and sundries, as well as going in to the University to deal with our mandatory migration to a new email system (the horror! ), and signing some papers relating to the closing of the house I salvaged this summer. I'll also go through the copy-edited manuscript for my chapter book Third Grade Reading Queen, and go out for a family dinner. And pet Snickers a lot. Tomorrow Gregory moves into his apartment, and Christopher will load my stuff into my little car, and I'll start driving off to the Dusty Farmer Motel in Kansas. All in less than thirty-six hours. According to Mapquest, there are two ways to get from Boulder, Colorado, to Greencastle, Indiana. You can take I-70: shorter in time but longer in miles (16 hrs 32 mins / 1071.51 miles). Or you can take Route 36 across northern Kansas: longer in time but shorter in miles (18 hrs 4 mins /1059.31 miles). I've decided to take Route 36. I Googled motels at a good stopping place for the first night, St. Francis, Kansas, and saw that the options were the It'll Do Motel or the Dusty Farmer. How can I resist??? The online reviews favored the Dusty Farmer, so I have a reservation there for Thursday night. And Route 36 crosses the Mississippi at Hannibal, so I have reservations at what sounds like a charming bed and breakfast in Hannibal - the Garden House - for Friday night, with a room with a four-poster bed, overlooking the river. I can tour the Mark Twain house and Tom Sawyer's cave! Ooh! I also rethought my choice of books-on-CD to listen to in the car. At first I bought myself Crime and Punishment, but then decided that 20 1/2 hours of it might be a bit, well, intense. So I went back to the bookstore today and bought The Paris Wife by Paula McLain, a novel based on Hemingway's years in Paris: 11 1/2 hours. I stopped by the AAA Travel Agency and stocked up on maps. My friend Rowan has already packed me a giftbag of tasty snacks. So I am all set to go! When I was a child, we went on vacation to a tiny lake in New Hampshire every summer. Our whole family was so excited about going that we sometimes left home the day before we were to occupy our lakeside cabin, drove the few hundred miles from New Jersey to New Hampshire, and stayed in a nearby motel, just to start the vacation a day sooner. Then on the other end, we were so excited about getting home that we would vacate our cabin and drive home a day early, too. Now that I have only five days left till I depart for Indiana, all I want to do is GO. I've said so many poignant bittersweet farewells: to philosophy department friends, writing friends, church friends, neighbor friends. I've crammed in every last little bit of Boulder summer fun. Now I'm ready to load up and GO! But I can't leave until I have two more farewell get-togethers, and until I help Gregory move into his new apartment on Thursday. Then I'll load myself (and my books and my clothes and one stuffed animal) into my car and start the eighteen-hour drive to my new life. I am going to come back in a year renewed physically, mentally, emotionally, spiritually, and financially. I am going to come back from this intermission ready to begin Act Three of my life, that stunning finale when all will be revealed, and everything will come right. I'm ready for this RIGHT NOW. But first I have to get through the next five days. Today is day three of the four-day ethics extravaganza hosted by our CU Philosophy Department: the Rocky Mountain Ethics Congress, abbreviated RoME. In its fourth year now, RoME draws philosophers specializing in ethics broadly conceived (metaethics, ethical theory, applied ethics, political philosophy) from all over the country and the world to Boulder for a few intellectually dizzying days at the start of August. I was one of the 37 people associated with the Philosophy Department who helped to review the papers submitted for the conference; I've attended quite a few sessions already, chaired one session, introduced one keynote speaker, and tomorrow I'll give my commentary on the paper "In Defense of the No-Reasons View of Love" by philosopher Aaron Smuts. Each day also has a most pleasant reception; today has free time for hiking and savoring other Boulder treats (I'll be taking keynote speaker Cheshire Calhoun on a tour of Boulder's Celestial Seasonings tea factory). It's all a bit overwhelming and exhausting, especially six days (!) before I leave for my new life in Indiana. But it's also sweet to have this last chance to remember how wonderful the intellectual life is here in my own corner of the world, how much I'm going to be missing even as I start out on my own exciting intellectual adventure. The remaining contents of the house I've been dealing with all summer have now been professionally packed and professionally moved into storage. I might as well put in my plug for Taylor Moving. I cannot imagine EVER working as hard as the three guys who came for two long, grueling days to do all the packing and moving. They were not only amazingly strong, but amazingly brilliant as well: how COULD they fit all that stuff into a 10 x 20 storage facility? It was a jigsaw puzzle of stunning complexity. And how could they be so pleasant and cheerful while working so hard, too? It's good every once in a while for those of us who think that we toil so mightily at our desk jobs to see what REAL work looks like. Now all that is left is the cleaning (Monday) and the closing (a week from Monday). And then this huge task will be behind me, the task that seemed so impossible in June. The hardest part for me (given that I am not employed by Taylor Moving) was simply the decision to take this on, to face the fact that it had to be done and that I was the only person who was going to do it. Yes, it would be time-consuming, yes, it would involve writing many checks for many thousands of dollars, yes, it would be heart-breaking, yes, it would seem to go on forever. But once I made the decision, all the the rest was really just logistics: daunting, expensive, sad logistics. But logistics are do-able. And what I began in June is now (almost) done in August. At our writing group retreat last week, we had a Saturday night discussion that focused, among other things, on the questions: What things do you do to sabotage your own happiness? What things can you do to sustain and nurture yourself instead? We each left with a goal to work on. The interesting thing was how small these goals were - and yet how important. One person, too busy with her demanding full-time job to find any time to write lately, is going to write a poem a day. Just one little poem. She's been doing it for four days now and is ENRAPTURED by this. Another person is going to buy a room-sized air conditioner for her upstairs home office so that she can work in cool peacefulness. A third person is going to start each day with exercise. And me? I'm going to check email only once an hour and not at all after 7:30 p.m. No more obsessive checking of email every thirty seconds all day long!! I was first going to try checking email just four times a day, but I decided, after consultation with the others, that it was better to start with a lesser goal that I could achieve, and work up from there, than with a more ambitious goal that would set me up for failure. So far I'm loving this reclaiming of my time and energy and life. If I win some major award between 10 and 11, well, it doesn't really matter if I have to wait 60 minutes to find this out. How much better to use that 60 minutes actually writing something worthy of winning the award, right? Little goals can make a big difference. I wasn't counting, but Google Blogger was, and this apparently is my 400th blog post. I've been blogging for two years now, posting sometimes every day, sometimes every couple of days, sometimes letting a week or more go by between posts. But even without too much of an attempt at rigorous self-discipline, too much self-flagellation to keep myself on task, it's added up to a tidy sum. Four hundred is a big number. This really does illustrate one of my major life principles: little things add up to big things. A page a day written in an hour a day adds up to 365 pages a year. A page a day written in an hour a day with LOTS of days taken off to do other things has still added up to at least a book a year for me. I've enjoyed wearing a pedometer and watching my steps over the course of a day add up to the target of 10,000 even without any significant trek, just by teaching my classes and walking back and forth across campus. Of course, this summation process can be problematic in certain contexts: I think we've all had the shock of getting a huge credit card bill at the end of a month in which we made no major purchases at all, just a series of $23 here and $37 there. An extra hundred calories every day will add up an extra pound around the waist at the end of the month. On the other hand, savings can grow in this same way, and giving up a mere hundred calories every day will trim a pound from the waistline every month, as well. Former Senator Everett Dirksen is often quoted as having said, in the context of the federal budget, "A billion here, and a billion here, and pretty soon it starts to add up to real money." (Prophetic quote, that!). A blog post here, a blog post there, and pretty soon it adds up to 400 blog posts. And that's real blogging.